Consider the ethanol plan. Growing corn to produce ethanol was supposed to help make us energy independent. What happened was that subsidies to grow corn (an energy wasteful process without the subsidies), did not cause gasoline prices to drop, instead it diverted food products to inefficient energy processes. This raised the price of grain which feeds livestock and corn syrup (used in practically everything as a sweetener). Inquiring minds may wish to consider The Case for Ending Ethanol Subsidies. 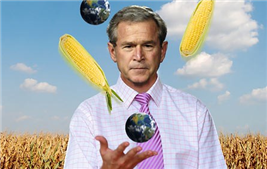 At a time of soaring food prices and concern over carbon emissions, George Bush needs to rethink his biofuel policy. Just in time for today’s Earth Day festivities, President Bush has announced a new initiative to combat global warming. He set a goal of stopping the growth in greenhouse gas (GHG) emissions by 2025 and reducing emissions thereafter. But rather than plan for 2025—which is another two or three presidencies away—Bush should immediately fix his ethanol policy, which is increasing GHG emissions and raising food prices not only in the United States but all over the world. American companies are still trying to digest the ethanol mandates passed by Congress last December. Congress mandated the production of 9 billion gallons of ethanol or other renewable fuels this year; that number will gradually increase until it reaches 36 billion gallons in 2022. In addition, ethanol producers receive a tax break of 51 cents a gallon, and corn growers receive huge subsidies that may increase in the next farm bill. Using ethanol for energy was supposed to be a win-win situation: the United States has so much corn, we were told, that it could use some to make gasoline, thereby reducing its GHG emissions and also reducing its dependence on foreign oil. But in the real world, unintended consequences are all too frequent. In addition, ethanol production is contributing to increases in the price of food, both in the United States and abroad. Not only is corn being made into ethanol, but other crops are being abandoned in favor of corn. Rather than set a new goal for stabilizing GHG emissions, Congress and President Bush could do one simple thing that would truly honor of Earth Day: eliminate ethanol subsidies and get rid of the mandates. By the way, that is what all subsidies do by nature. Subsidies never work. Instead of backing away from an ethanol plan gone haywire, Congress is looking at compounding the problem with yet another ridiculous energy bill. Please consider Senate Democrats unveil new energy tax plan. Democrats in the Senate on Wednesday unveiled a new energy package that would revoke $17 billion in tax breaks extended to big oil companies like Exxon Mobil Corp and slap a 25 percent windfall profits tax on firms that don't invest in new energy sources. The Consumer-First Energy Act -- assembled by Senate Majority Leader Harry Reid and other key Democrats -- would also stop the Energy Department from filling the Strategic Petroleum Reserve until crude oil prices average $75 a barrel or less for 90 days. The Democrats' energy bill seeks to lay the blame for record-high gasoline prices over $3.60 a gallon on the Bush administration, big oil companies like Exxon and the OPEC oil cartel. It also seeks to rein in speculation in oil markets, which Senate Democrats see as a prime mover behind crude oil prices which hit a record high of $123.80 a barrel on Wednesday. The bill would prevent companies that trade U.S. oil futures from routing transactions through off-shore markets to evade position limits and requires the U.S. Commodity Futures Trading Commission to boost margin requirements for all oil futures transactions. However, CFTC Chairman Walter Lukken told a Senate subcommittee on Wednesday that speculators were not behind the jump in oil prices and he warned that higher margins would push energy trading off government-regulated exchanges. "I think there would be a migration off exchanges," said Lukken, adding that higher margins act like "a tax on traders." Eliminating tax breaks for oil companies is reasonable enough given that all tax breaks and subsidies across the board should be eliminated. However, the rest of the bill is nonsense. Once again no one takes the problem back to the original source. One problem is peak oil, and I propose the free market would find a solution, if left alone. Instead we have been sidetracked from finding a real solution by an inane ethanol program, that divert resources from finding that solution. William Engdahl writing for Financial Sense says Perhaps 60% of Today's Oil Price is Pure Speculation. I am not going to debate the merits or demerits of the article. However, if speculation is a problem, then perhaps one might ask why speculation is a problem. But Congress is absolutely incapable of this kind of thinking. If speculation is a problem (and it's easy to believe that is the case), then it is caused by monetary policies worldwide that are encouraging speculation. After all, speculation fueled an enormous housing bubble, not just in the US, but worldwide. So if one wants to stop such speculation, the all one has to do is address the root cause of the problem: global monetary policies by the Fed in particular, central banks in general, Congress, and governmental bodies elsewhere. Check out the actual solutions countries are coming up with. Ambrose Evans-Pritchard is discussing the situation in Global free market for food and energy faces biggest threat in decades. The country's Forward Markets Commission said contracts for soybean oil, chana (chickpeas), potatoes, and rubber had been banned for four months, even though a report by the Indian parliament last month concluded that soaring food costs had almost nothing to do with the futures contracts. Traders in Mumbai slammed the ban as an act of brazen political populism. Argentina has banned beef exports and placed an export duty on soybeans. Jim Newsome, the head of the New York Mercantile Exchange, said trading curbs on hedge funds woold achieve nothing. "All you're going to do is potentially cripple the US exchanges and move that flow of trading to non-US regulated markets," he told the Wall Street Journal. Caroline Baum knocks another one out of the park with Election Year + $124 Crude Oil = Silly Solutions. The confluence of record oil prices and a presidential election year is proving to be an irresistible combination for Congress and the candidates, all of whom happen to be members of that esteemed body. Two of the three U.S. presidential contenders are promoting the idea of a federal gas-tax holiday this summer. Two of the three (a different duo) want to enact a windfall profits tax on oil companies, a bad idea whose time has apparently come (again). One of the three wants both. That would be Hillary Clinton, Democratic senator from New York. Populist millionaire Clinton (millionaires make the best populists) has lashed out at the oil companies, accusing them of market manipulation and collusion. She's railed against speculators, those evil traders who buy when everyone else is selling and sell when the crowd is buying. "If the stated goal of government policy is energy conservation, energy independence and the development of alternative sources of energy, lowering the price of gasoline -- waiving the 18.4 cent-a-gallon federal excise tax for even three months -- is counterproductive. The demand curve is downward sloping, which is a fancy way of saying that at a lower price consumers demand more." That ought to be obvious, especially to Hillary. So either she is not as bright as people think she is, or she is more guilty of political pandering than her opponents. Take your pick. I am sticking with what I said in Hillary's Scorched Earth Policy. Instead of addressing the real problem, political pandering has now gone global, with Hillary Clinton as the top cheerleader. The US cannot mandate what the rest of the world does, but Ron Paul would sure clean up the act here. I am still hoping that Obama finds a place for Ron Paul in his administration, preferably as vice president, but a replacement of Bernanke would suffice, with an ultimate goal of elimination of the Fed itself.